Over the next two days we have one of the few times in the church year when we have a feast of a mother and then her son the next day, both being saints. 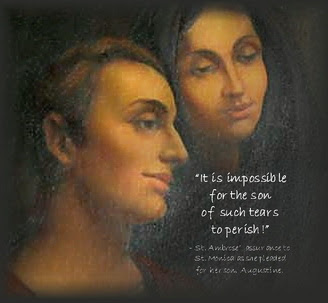 They are St Monica and St Augustine. This morning at morning prayers something came up which I never thought of before. St Monica is famous for praying hard for the conversion of her son and it is said that she often cried when she was praying for this. I often pray for the conversion of my children and what came up this morning was that my wife said that I should begin and pray to St Monica for her to intercede for my children. When you think of that it would be a good idea: she won the conversion of her son, perhaps she can help me to win the conversion of my children.